FASTING for 12 hours…yay or nay? Have you ever been confused by nutrition - specifically around fasting? You may hear that it's ok, even beneficial but then are doubtful after hearing from another source that breakfast is the most important meal of the day or that you need to boost your metabolism by eating as often as possible. If you are nodding your head right now, then you're going to want to watch (or listen to) this recent live video I did on Facebook all about it. In the video I talk about fasting, what happens inside our body during a fast, and my recommendations for most people, most of the time. Please note: the 6-week group program I mentioned in the video is no longer open for registration at this time. We are currently working hard on making incredible body + mind transformations. Stay tuned for a future email (likely a few months from now) if you'd like to grab your spot in the program next time! Fat loss - when the heck should I eat? It's a common misconception that we need to be eating a million times a day in order to increase our metabolism and burn more fat. First of all, let's talk about who is looking to burn more fat? If you are looking to lose weight or even just "tone up"…you're looking to decrease the excess fat you have on your body. Watch my latest live video (or just listen - you don't need to see my face) as I get into how to tap into your fat stores to use them up as energy. We're discussing meal timing (when and how often) and we nerd out on what insulin is and the role it plays in fat storage and fat loss. It's a pretty unknown concept to most. Definitely worth the 35 minutes if fat loss is on your agenda! 1) Insulin is a fat-storage hormone that helps us carry sugar into our cells to use as energy. Whatever we don't use gets stored as fat to use at a later time. 2) If insulin remains elevated, our bodies remain in fat storage mode and do not switch over to fat burning mode. 3) Lowering insulin is what allows us to switch over to fat burning mode. We can lower our insulin by focusing on nutrition upgrades and timing our meals properly (hint: eating every 2 hours will not allow your insulin levels to come down for you to enter fat-burning mode). Watch or listen to the video for lots more details and for the 3 tips I share at the end so you can get going on your fat loss goals right away!! P.S. If you’d like a (FREE) 3-day meal plan designed to help you with WHAT to eat and WHEN to eat for healthy fat loss, you can grab that right here! Enjoy! Metabolism article (with Dr. Axe)! But, I did get to write alongside one of my favorite writers / educators in the holistic health space… Dr. Axe! The article all about metabolism came out last week in Glam. If you'd like to find out if we are able to improve our own metabolism (spoiler alert: we can! ), you can check out the article right here. P.S. If you struggle with a sluggish metabolism and are looking for a way to kick things in gear, grab my FREE 3-Day Meal Plan! In my latest live Workshop Wednesday video, I mentioned 3 important things I see so many of my clients skipping when they go about planning their meals out for the week. While almost everyone considers what they have in the kitchen, their budget, what they enjoy eating, and when they’ll be going shopping, these 3 things are often overlooked. Goals - are you putting together your meals with your ultimate goals in mind? 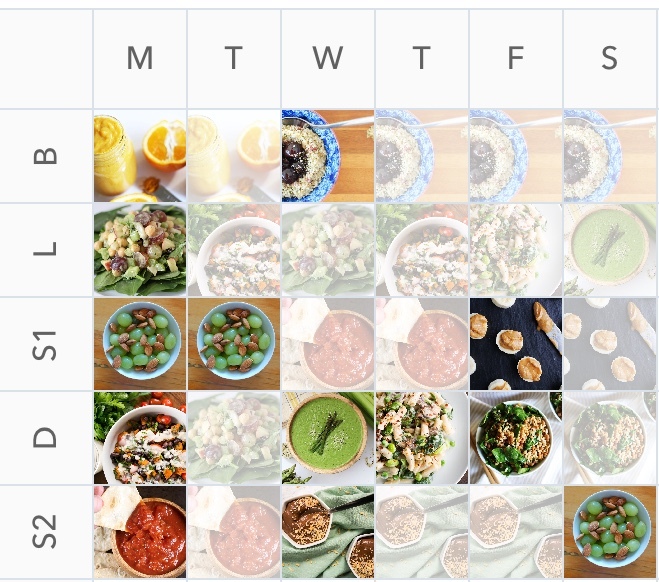 Does the meal plan reflect the types of food your body needs, the amount, the meal timing…? Other people - who will you be cooking for? Are you making side dishes work for you so that everyone can enjoy the same meal and still be eating according to their body’s needs? Check out the video for my tips and let me know in the comments…do you meal plan? P.S. Would you like a FREE meal plan to get you started? I’ve created “The Hangry Women’s 3-Day, Plant Based Meal Plan for Losing Body Fat” and would love to get you your copy! Thank you for signing up for your copy of “The Hangry Women’s 3-Day, Plant Based Meal Plan for Losing Body Fat”. This will arrive in your inbox shortly. I can’t wait to hear what you think of the delicious recipes! The 4 most popular diets...and what they have in common. So, one of my favorite ways to share wellness tips and strategies is through my weekly, live Workshop Wednesday videos. My most recent one was about the 4 most popular "lifestyle" diets at this time and what they all have in common. Yup, that's right! There are 3 things you can do right now that will help you get the same health-promoting and weight loss results that people following these top 4 diets are raving about…without a million rules or a list of "good" and "bad" foods! Check out the video right here and start to tackle these today! Ready to work your backside? Well gee…that was really personal! Sorry about that. But not really ;-) because I hear from so many women about how they'd love to sneak in workouts at home and focus on toning up their boot-y! So, I figured I'd share a few of my favorite moves in a super-duper-fast video demo (do you have 36 seconds?!). Try these 2 exercises for your glutes. Scale the reps and sets up or down depending on your current fitness level. Add in a march-in-place warm-up and weave in a few sets of jumping jacks or stairs to turn up the heat. Your goals are set. Now what?!? Don't wait for motivation to 'strike'! Have you ever entered a new year (like right now) with tons of great intention, motivation, and a list of things you want to magically change about yourself or your routines? And then something derails your progress a day, a week, or a month in? Or you're making so many changes at once it becomes impossible to get them all straight? I've been there! In fact, I'm the queen of lists and dreaming big and taking on wayyy more than I can manage (sanely, anyway). My latest Workshop Wednesday video was all about how choose where to focus and how to not rely on feeling motivated to do so. The truth is, successful people are no more motivated than you or I. Successful people just implement a plan that involves taking action regardless of motivation being present or not. The specific tactic I get into in the video is called The Domino Effect. If you have been nerding out on goals and creating new habits lately, you're going to want to check out this video! I get you. I do. The holiday cookies, pies, bread, pizza, chocolate, and wine are SO DELICIOUS, but come with tons of baggage like your favorite toddler when you try to leave the house for 30 minutes. It can be tricky to gain any traction with your goals when you're still battling those cravings for sugar and carbs. So, as a thank you for allowing me to hang out with you every week in your inbox, I have a surprise for you! If you’re not yet on my newsletter list, it’s not too late to join! Sign up at TaraAllenHealth.com - right on the home page, and get ready to open a new email everyday next week with a new tip or habit to practice that will have you well on your way to eliminating those cravings by week's end. Sound good? Great! I'm excited to hear how awesome you feel at the end. Use #crushthecravings and tag me in your posts as you track your progress! But, chances are you are reading this at another time. Maybe it's Tuesday night now or Wednesday morning. Regardless of whether or not you celebrate Christmas, you might be thinking ahead to more parties this week as New Years approaches quickly. If you thought that I was going to tell you right now to avoid alllll cocktails, cookies, and pie…you thought wrong. I want you to enjoy yourself…with intention! And, I want you to feel as though you're not "off the wagon". One way to allow all of the merriment to happen and also not feel like you've tossed away all hope at any of your health goals is to keep (or re-establish) an exercise routine right now. Before I lose you here, I'm not talking about going from nothing to 60-minute workouts! How about 5 minutes today? How about 10 tomorrow? What can you do? Let's start there. In my latest Workshop Wednesday video, I shared a little bit about how to set goals in a completely new way (hint: behavioral over outcome), and also get into 7 ways to get your fitness in during the holiday season…and Winter in general. There are unique hurdles that present themselves this time of year, but there are also unique opportunities! Tip 1: Commercial breaks. During your favorite holiday movie, Netflix, or DVRed show, march in place or do dips on a chair. Tip 2: Be creative. Ten squats every time you go to the bathroom (yes, even at work) is that much more than you're already doing. Tip 3: Festive decorations. Bundle up for a walk or run as a different way to experience the beautiful lights this time of year. Tip 4: Holiday fun run. There is still time to sign up for a New Year's run or walk. Be social and active at the same time. Tip 5: Track your steps. Use an app or wearable device to try to improve the number of steps you take. Using those gifts cards or making returns at the mall? Perfect! Do a few extra laps. Tip 6: Shoveling. You have to wait for Mother Nature to cooperate for this one, but take advantage when the white stuff gets here. Which one of these is your favorite? I'd love it if you hit "reply" to this email and let me know. P.S. If you want to catch the video, here it is! The holidays are upon us! If your life is anything like ours, you will have parties and gatherings and events everyday for the next week and a half. :-) It’s fun! And also, it can be tricky to manage any type of health goal with all the food, cookies, alcohol, and hot cocoa. Check out my recent Workshop Wednesday video in which I shared my top tips for not just surviving, but actually THRIVING, during this festive time. P.S. Stay tuned until next week when I share Thriving this Holiday Season, Part 2: Fitness. Eliminate these 2 things to see near-immediate results! It can be hard to stay focused. It can be tricky to remember how to fish for yourself. Today I'm sharing with you 2 things to eliminate (or greatly reduce) from your plate that will bring you near-immediate progress. These tips are NOT easy - especially this time of year. So, you get to choose when to use them. Save these tools in your tool belt for the day after a particularly fun party. :-) Or, start immediately so you can get a bit of traction and energy before all of these events. It's up to you! They are not doing you any favors for your health. If they are soul food for you - as in, your soul is happy when you eat them - then by all means, keep some of it in! But, choose intentionally. Be picky. Save it for special foods and special occasions. Watch how much better you feel when you do that! P.S. 2019 is coming! It's our year and we're coming for it. One of the things that I do to give me a leg-up is keep my healthy habits in place. If working out consistently or eating properly for my body type and goals weren't a habit, I wouldn't be able to accomplish a whole lot, to be honest. This took some time for me to establish. And then, I had to figure it all out again post-babies. Things change. But, the fact that I need my health, energy, and confidence in order to go after my dreams has never changed. If you are looking to improve your health, energy, and/or confidence in the New Year so you can crush your goals…and your life, then I think you should! That's where the magic is. *Limited offer: This offer is available to the first 5 people that email me.